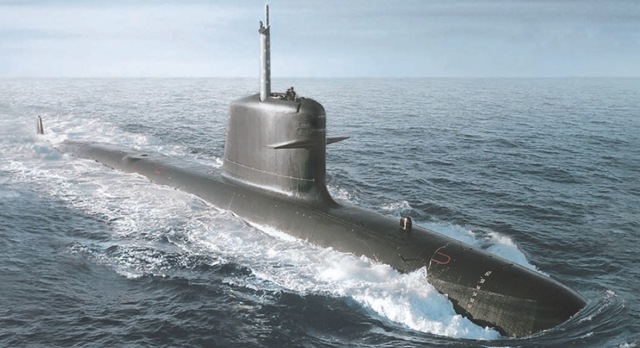 Malaysia’s first submarine KD Tunku Abdul Rahman has left Toulon, France on July 09 to operate in Malaysian waters. The Scorpene, a diesel-electric propulsion submarine (SSK) built by French military shipyard DCNS at Cherbourg, in partnership with Spanish naval shipyard Navantia. Has 35 crew members and is commanded Commander Zulhelmy bin Ithnain (RMN). The submarine project to acquire two Scorpene submarines at a cost of 1.04 billion Euro (about RM3.4 million) was signed in 2002. The first submarine was launched on October 23, 2007 with a mixture of ‘Air Yassin‘ and water from the holy Zam-Zam well in Mecca instead of the customary breaking of champagne bottle. The sea trials including firings of Black Shark heavyweight torpedoes and missiles were completed in December 2008. The submarine was handed over to Malaysia on January 24 this year at the French naval base in Toulon, France. The submarine is expected to reach Malaysian waters by early September after transiting through Jeddah, Djibouti and Kochi (Cochin). The submarine is expected to be at Lumut and Port Klang for a few days and then reach Sepanggar Naval Base in Sabah. The second of the series, KD Tun Abdul Razak, is scheduled to be delivered in late 2009. The other countries opted for Scorpene are: Chile – two; India – six. KD TUNKU ABDUL RAHMAN- 1st RMN Submarine-TV3 Buletin Pagi 1. Scorpene: KD Tun Razak, launching of second submarine. Read more from Embassy of Malaysia, Paris, Bernama.